It took the 1989 Loma Prieta earthquake and the damage to three of their twelve stores to bring down California's oldest retailer, established in 1855. Wild West was brought in with a Silicon Valley High Tech marketing crisis team to attemp to save the stores. Despite an extensive effort and some creative marketing, the chain couldn't be saved. 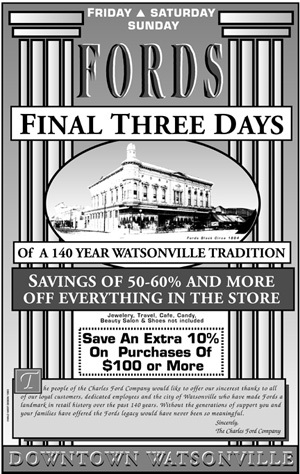 This full page newspaper ad truly marked the end of a California tradition.